The Mana comes in 90 sq/in for maximum power, and 82 sq/in for lighter weight and faster cadence. These blades feature the same winglet technology of the Konihi, with a little more scoop and slightly deeper concaves. This paddle is our best seller in Canada! Price: $699 with your choice of handle. See below for choices. 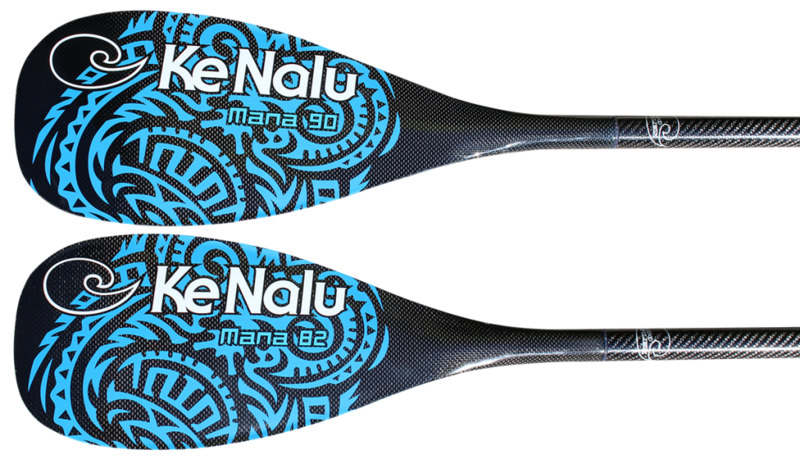 The Mana blade has the now-famous winglet design, and is the absolute ultimate in performance for those who demand the finest paddle at any price. There are not many paddles this light, and there are no other paddles with the same performance. You’re paying for extensive design and testing that has been done to make this the best performing paddle there is in the world, period. The Mana was designed with racing in mind. It utilizes “winglets” taken from aviation technology to make the blade work more efficiently and help avoid problems like blade flutter/wobble. Just like an aircraft wing a paddle creates high and low pressures when moving through the water. Just like a wing when these pressures converge they create vortices which lead to inefficiency as well as other problems. The winglets help divert these vortices out and away from the back of the blade giving you a more efficient stroke, improved blade stability and increased drive. All of this combined leads to a better paddling experience, leaving you less fatigued. If you’re a serious racer or want the best performance available, this is the blade choice for you. Sup Examiner review of the Konihi, which is similar to the new Mana here. Click this link to read the latest reviews of the Konihi on the Standup Zone forum. The Mana is our number one seller! Mana 82: 450 to 470 grams. Mana 90: 460 to 475 grams. Many paddlers prefer the extremely lightweight 82″ size which is much more powerful than you’d expect from its size. If you’re a strong paddler and want even more pulling power but still have a lightweight paddle, go with the 90″. Note: all Mana paddles in Canada come with the Flex 100 shaft for minimum weight. Also available are custom orders using the Flex 90 or xTuf(stiff), shafts. Easy ordering! Just pick the blade size, your favourite handle type, and we’ll ship to you the next business day – for free! If you’re not exactly sure which to choose, we can help you personally by phone, or email! The Ho’oloa blades are among the smoothest paddles anywhere and they’re great on both flat water, and in the surf. The differences between the Ho’oloas and our original designs are subtle but the way they feel in the water is entirely different! It has a slightly softened catch due to the narrower width but more drive due to the increased length and larger “sweet spot”. The narrower overall profile also helps to reduce flutter tendencies & keep the power more “centered” around the shaft. The 84 sq/in blade is extremely light and is much more powerful than you would think from its size. This blade lets you paddle with a medium to high cadence. If you’ve used the Wiki blade in the past, you’ll find this one similar, but slightly smoother and more powerful. Ho’oloa 84 (full-length shaft): 446 grams. Ho’oloa 95 (full-length shaft): 450 grams. Price: $599 with free shipping! Includes your choice of Ergo, or Ergo Tee handle. Note: all Ho’oloa paddles sold in Canada come with the Flex 100 shaft for the best stiffness, and minimum weight. Easy ordering! Just pick the blade size, your favourite handle type, and we’ll ship to you the next business day – for free!